Want to have a nice home but your pet keeps chewing and scratching your stuff to smithereens—or worse, peeing on everything? 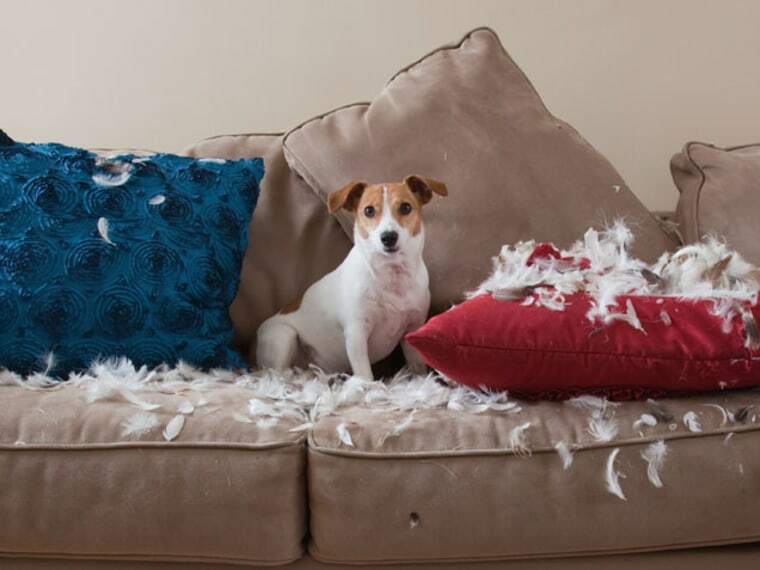 Check out these tips and tricks from pet experts to stop the destruction. Animals have very short memories, so they won’t connect their past bad behavior—even if it was only two minutes ago—with your yelling or other punishment, according to the experts at the ASPCA. In other words, going ballistic when you find something destroyed won’t accomplishing anything. “If you don’t catch your dog in the act [of peeing] but find an accident afterward, do nothing to her,” advises the ASPCA. 2. Correct bad behavior properly. If you catch your dog in the act of peeing inside the house, clap loudly—just enough to startle her, suggests the ASPCA. If startled, your dog should stop in mid-stream, giving you the chance to immediately lead or carry her outside—gently and encouragingly. Let her finish outside, and then reward her with happy praise and a treat or two. For cats, a small spray bottle can be effective tool when you catch him scratching where he shouldn’t. But don’t let your cat know that you’re the source of the spritz, warns Life Hacker. You want your cat to associate the random blast of water with scratching on the couch or furiously digging into the carpet, not with you being nearby. 3. Rule out medical problems. It’s important to figure out if the misbehavior is the result of a physical problem your pet is experiencing and perhaps can’t control. According to the ASPCA, a dog may soil indoors due to incontinence problems, changes in diet, medications, age-related difficulties, gastrointestinal upset or anxiety issues. Similarly, urinary tract infections and kidney failure can cause cats to produce more urine, or add an increased urgency to urination, causing them to have accidents, says Pet MD. Chewing and scratching by dogs and cats can also be rooted in medical problems, so talk to your vet about any changes in behavior. 4. Make your nice stuff smell and feel bad (to your pet). Similarly, the upholstered corners of couches and chairs are a scratching magnet for cats, but you can make them less appealing by applying an herbal spray deterrent like No-Scratch that replaces the territorial “markers” left behind after scratching with an unpleasant scent and will discourage repeat scratching, according to Drs. Foster and Smith. Double-side tape strips, such as Sticky Paws, can also help. Cats’ paws are extremely sensitive to touch, making sticky surfaces exceptionally annoying, say the doctors. Both options are nearly invisible to the human eye or nose. 6. Give them some acceptable things to destroy. Pets will be pets, so you need to give them appropriate (non-shoe) options for chewing and scratching, which are their natural—and unchangeable—behaviors. According to Perfect Paws you should litter a dog’s space with a wide variety of toys, including particularly enticing toys such as rawhide and long marrow bones soaked in flavored soups. After they dry, give a different flavor to the puppy each time you leave him alone. Sterilized marrow bones and Kong toys can be stuffed with liver treats or cheese, giving a pup hours of entertainment trying to extricate the treats from the toy. For cats, provide more appealing scratching alternatives than your upholstered and wood furniture. If your problem scratching area is around doorframes and the wooden legs of desks, consider a piece of cat furniture or post made of cedar, say Drs. Foster and Smith. If your cat can’t resist the soft sides of your couch or the nap of your best rug, choose a carpeted cat tree or perch. Sisal, the rough and tough marine-grade rope that scratches back, is great on a vertical post or tree. “No matter what tempting option you provide to replace your own furniture, a pinch or spray of catnip on the new scratching area will further encourage her to seek it out,” they say. Location of toys and scratching posts is also important. “Put the posts where your cat wants them—next to her sleeping spot for a quick stretch after a nap, or by the front door for a really intense session after she greets you,” recommends the Humane Society. 7. Up your engagement with your pet. Face it: If you leave your dog alone for 12 hours, or don’t clean your cat’s litter box, you’re going to get some pee and poop on the floor. A dirty litter box is one of the first things that sends a cat peeing elsewhere, according to Pet MD. And if you’re gone for more than four hours at a stretch, consider getting a neighbor or hiring a dog walker to take your pup out for a midday romp. To curb excessive cat scratching, be sure you’re clipping your cat’s nails frequently. You can even give her a “pedicure” with Soft Claws Nail Caps, which cover a cat’s sharp nails and can make scratching less destructive to your furniture. 9. Get some stylish and functional pet accessories. You have a pet, and that means your living room isn’t going to look like the picture-perfect cover of House Beautiful. It’s going to have pet stuff in it – toys, leashes, litter boxes, etc. The good news is that there are stylish options for all of these items. Cats are more likely to use an easily accessible litter box than one that’s hidden away, so buy one you won’t be embarrassed for people to see. (We like the super modern-looking ModKat and these other amazing options.) Looking for a scratching pad that doesn’t look like it belongs in a ‘70s rec room? Try the sculptural one from Lui + Vigo or the cool D.J. Cat Scratching Pad available at the ASPCA’s store.